The road construction, drainage, sewage and groundworks contractor, A Molenaar, has bought an ideal machine for its new material-handling site in the form of the Hitachi ZW180-5. It has already made a significant impact loading a steady stream of trucks and trailers at sister company Molenaar Zand en Grond BV’s stockyard at Bergambacht, east of Rotterdam. The new wheel loader was delivered in November 2014 by HCME Domestic, the domestic dealer of Hitachi Construction Machinery (Europe) NV (HCME). The company’s latest acquisition will help to supply its own road projects (50% of the output), and meet the needs of other contractors and private customers in the region. A Molenaar was founded in 1941 by Andre´’s grandfather, and his three sons are the fourth generation of the family to work in the company. The firm’s first Hitachi excavator was an EX150LC and, after 25 years of being a loyal customer, it has purchased a total of 28 machines from HCME Domestic.The ZW180-5 is the first medium wheel loader in the fleet — and the first example of this model working in The Netherlands — as this is the only application that has required a product of this category and size. 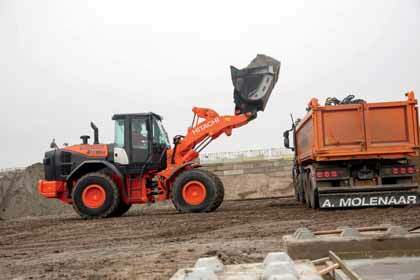 “No other equipment works as well as Hitachi construction machinery,” adds Andre´, who also used to be an operator. “These are the best machines and I have no reason to buy another brand. Hitachi is the complete package. HCME Domestic also stands behind its products through excellent service, a favourable total cost of ownership and the emphasis placed on creating solutions should any issues arise.